While the title - 'Maximising Fruit Set and Quality' is an all encompassing overview of the many factors inherent in the simple production of 'quality' apples, pears and stone fruit, Leon Jahae made the understanding of the influences both entertaing and scientifically illuminating. Leon concentrated on a few topics, with general remarks on internal and external quality. The mantra; "it all starts with the soil" is forever the starting point. The medium the plant/tree etc is planted in is the first factor to examine. While many soft fruits: Strawberries, Raspberries, Blackberries and Blueberries are increasingly being grown in soil substitutes (coir) in pots, apples, pears and stone fruits still depend on good soil for the production of a quality fruit. Organic matter is important for the water- and mineral management in the soil. 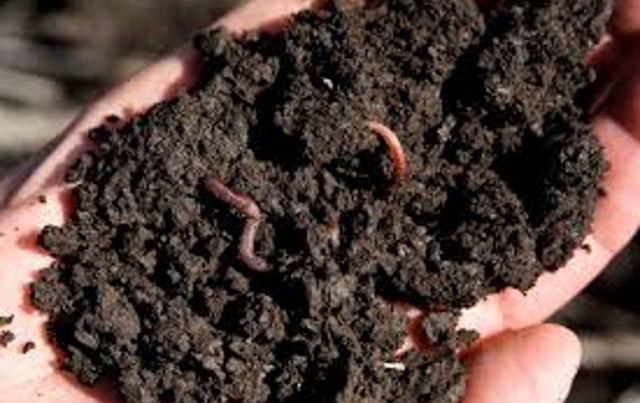 Also the air-content (soil structure) of the soil is positively influenced by the organic matter. Most soils should have a percentage (of OM) higher than 3.5%. A study of soils in Michigan demonstrated potential crop-yield increases of about 12% for every 1% organic matter. Organic matter consists primarily of C, N, P, S.
In fruit growing this is usually less of a problem, but to keep on encouraging soil activity applying composts if affordable and practical? While the soil quality is the foundation, many other factors determine the finished quality of the fruit. Climate is a major factor; determining potential yield and cosmetic and eating quality. Replant disease and stress influence the growth of the tree; it is important the soil is free of Apple Replant Disease and the tree is not stressed in its early years, and in its production phase. Choosing the right colour or mutation of a variety is a basic requirement; choose the right clone and the 'first pick' will be a high percentage of the fruit on the tree. 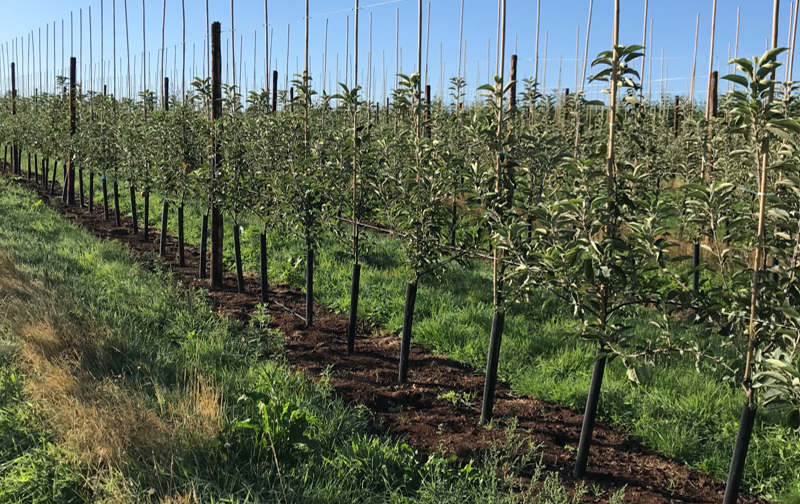 Choose the wrong one and the 'essential first pick' may be no more than 40-50% it can lead to removal of the trees or grafting over to a more suitable variety wasting valuable investment. 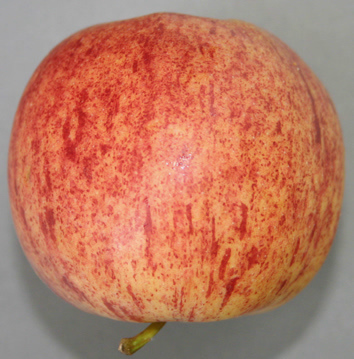 Fruit size has always been important, but in today's demanding environment the optimum fruit size required by the retailer is critical and the importance of thinning and pruning techniques vital. 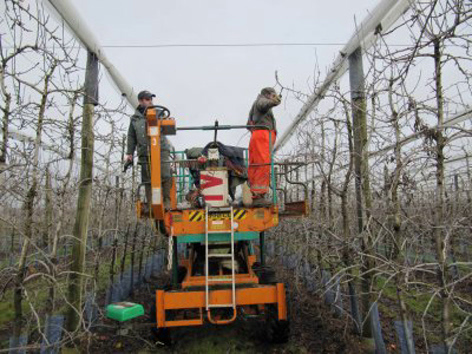 Correct thinning and pruning means:'a better leaf/fruit ratio, better light distribution in the canopy and 'in theory better colouring, higher brix (sugars) and better fruit firmness. Erratic weather conditions during the flowering period and temperatures during cell division determine the potential yield and quality; Light levels during the vegetation period influence what happens within the tree - "we can maximise the light interception by managing the tree structure to optimise interception, but critically the level of light available is due to the fluctuation of nature. However, they all have an important effect on: Sugar (Brix) Firmness/shelf life and Storability. In future limitations on the availability of water for irrigation purposes, further reduction on use of mineral fertilizers and pressure from consumers (read retailers) will increase challenges for fruit growers! Cation-exchange capacity is a measure of how many cations can be retained on soil particle surfaces. Negative charges on the surfaces of soil particles bind positively-charged atoms or molecules, but allow these to exchange with other positively charged particles in the surrounding soil water. This is one of the ways that solid materials in soil alter the chemistry of the soil. CEC affects many aspects of soil chemistry, and is used as a measure of soil fertility, as it indicates the capacity of the soil to retain several nutrients in plant-available form. 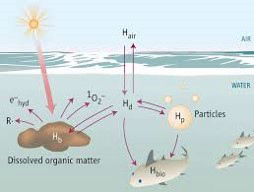 It also indicates the capacity to retain pollutant cations. A CEC under 100 is low; A desert-sand will have a CEC of 20-30. 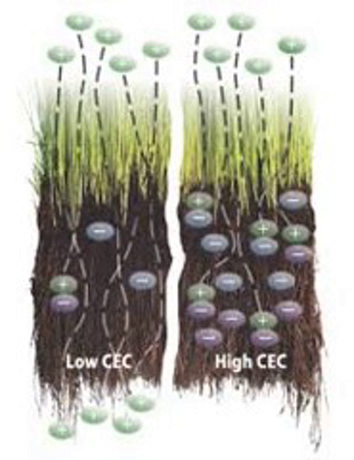 CEC over 150 means the soil can contain a lot of nutrients. These types of soils won't fluctuate a lot in their nutrient content as the capacity of holding nutrients is very large. These soils are moderate clay soils. This means that if you have enough of a certain cation in the soil (like Ca or K), the soil can supply a lot of this element even when you do not apply any nutrients/fertilizers. A high CEC also means that if there is a shortage of a certain nutrient you need to apply a lot of fertilizers to reach a good level. Depends (a bit) on the susceptibility for Ca related diseases. On heavier soils, the potassium saturation often needs to be closer to 5 and light sand closer to 2-3%. Gypsum applications for soil improvement? We have a great variation of soils - From very light sand to rich brickearth (Loess) soils - From very shallow soils to deep soils - Old replant sites and virgin land - Wetter climates in the west and very dry in the south east. Still, the specification for the trees that we plant seem to be all the same! We mainly plant strong and very well feathered trees on M9. It is a huge challenge to get the right balance between roots and trees; This puts additional stress on the trees. Next to that, we expect these trees to carry a substantial crop in year 2, this is to justify the investment which puts even more stress on the trees but also on the grower. 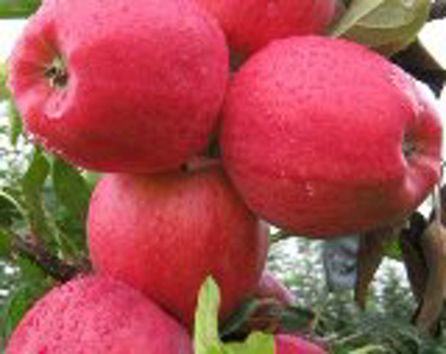 Growers may ask; Are the trees on offer really the best trees for sustainable fruit growing? In my climate and my conditions? Can we grow the same quality and yields after Glyphosate will be banned? More robust rootstocks: M26 and C41, are they an option? Do we really need to start with very well feathered trees? Using a 9 month old tree on a stronger rootstock (like M26) that has not overwintered in the nursery and has not been pushed for growth. 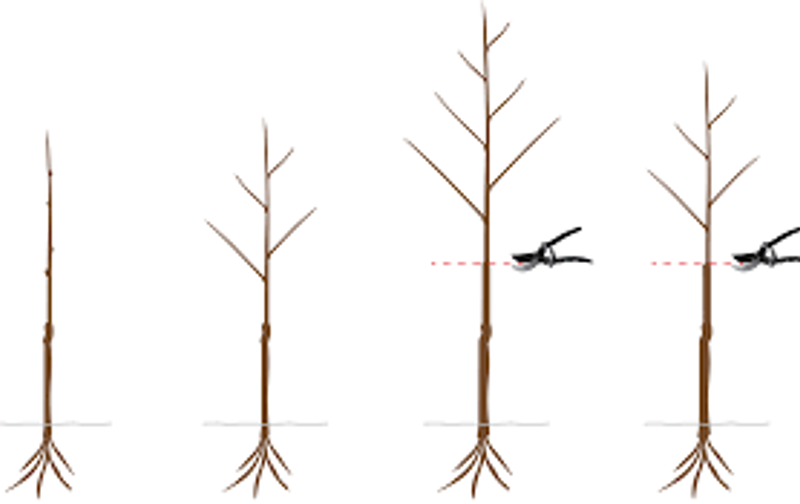 A lighter tree will get quicker into balance (roots and tree), so less stress to find and get the balance. These trees produce branches in year 1 after planting ( trees on slightly stronger rootstocks). Furthermore they will produce a moderate crop in year 2 on the base of the newly formed feathers, consequently leaving less stress on the tree. 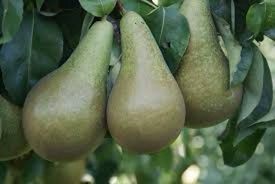 Due to the stronger rootstock which creates less stress on the trees, the incidence of Neonectria reduces considerably. 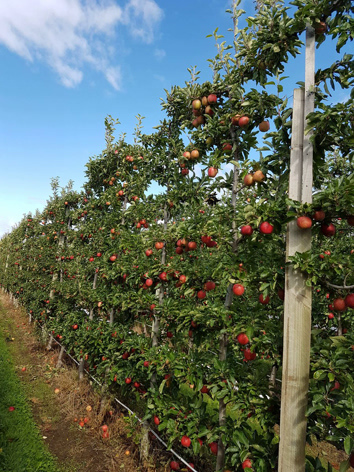 Basically what Leon is saying is: "as a standard practice most growers plant a strong tree with well developed branches capable of growing yields of 25 - 30 tonnes (or more) apples per hectare in the 2nd leaf (18 months after planting) - but is this the best way to proceed? planting a 9 month tree and allowing it to gain strength before carrying to much crop load, may be a better 'long term' option for tree health and productivity. 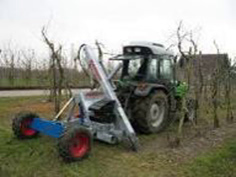 Selective (preventative) root-pruning:timing of root -pruning; Single sided or double sided; Straight or under an angle. Mechanical pruning: Good growth reduction straight after harvest; Pruning at the 10th fully expanded leaf during early summer. The ratio of Fruit & Leaf is very important. 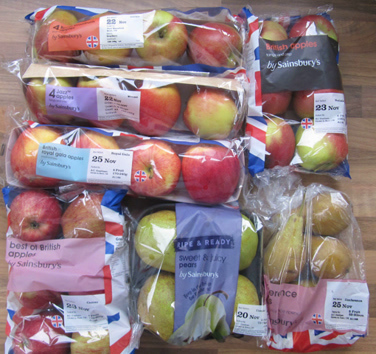 "We discussed this earlier and established the importance of this; The problem is that UK retailers want 'small apples' while on the continent consumers favour larger apples"
98/75 X 100% = 130(%) 30% more apples needed for the same yield, combine this with lower light levels and temperatures. The importance of leaf quality; This is always essential but in the UK, it becomes even more critical. Demand for smaller fruit - often challenging weather conditions during bloom and cell division - low light levels during the summer! We all agree: Foliar feeding needs to serve a purpose! Foliar feeds enhance the quality (similar to energy drinks and gels for humans) rather than supply the basic needs of the tree, which are sourced from the soil nutrients. 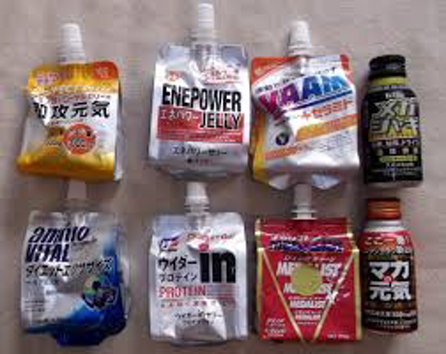 Below: Energy Drinks and Sports Gels deliver comparable benefits to humans that Foliar Feeds do to plants. 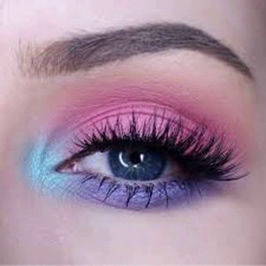 Used to target and overcome energy drawing/exhausting situations; Furthermore, during moments and stages when the trees have to perform above normal. So most importantly during the early part of the season when a lot of things happen at the same time; Often at a stage of adverse weather conditions. Most importantly, during the early part of the season:To keep the rosette leaves (apples and pears) in the best condition possible and to ensure/improve early Calcium uptake. The earlier the better! The English Apple Man Comments: "I remember well my father was a devotee of Maxicrop (liquid seaweed) and in some springs when the leaf was under stress due to waterlogged soils and subsequent rapid drying of the soil in late April/early May when the tree was unable to draw nutrients from the soil, Maxicrop kept the leaf in good order until 'normality' returned! 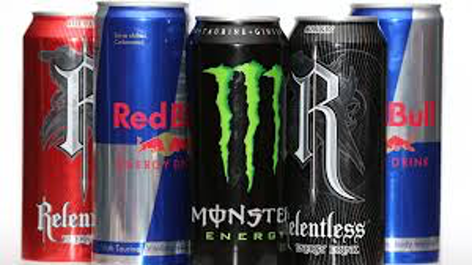 Has the same effect as energy drinks when used incorrectly! Compare: there is no need for producing large big (lazy) green leaves (on the extension growth) - Use when required - Do not overdose as this will increase the salt contents on the leaves and this will have the opposite effect. Green background - More blush - Less russet on the fruit! Why did AUK introduce Filocal, back in 2010? An early and safe source of Calcium on apples - Easy to mix and no residues. The 3 different Filocal blends address the needs of the trees for different growing stages. - All small fruit crops such as strawberries, blackberries, currants, etc. Dosages are dependent of crop density, age and the need for the different elements. Click on FILOCAL for more detailed information. Apples and pears have "mixed buds" (Dutch) and "leaf buds"
Stone fruits have only "leaf-buds" and "flower buds" both are separately and no "mix-buds" exist. So in Stone Fruit it is essential to accumulate leaf-mass as quickly as possible - these leaves are important to assist the young fruit as much as possible - this also causes a decline of fruit drop. Certainly in cherries, during the early part of the season: it is about frequency and not about quantity of foliar applications - best fruit-set results in programs where the grower has the discipline (or the option) to reduce the application intervals to 3-4-5 days. Of course, during adverse conditions this is highlighted as more important. Amino acids are the constituents of protein, carbohydrates, chlorophyll etc. and are very well absorbed by the leaf and integrated in the photosynthesis. In that way the plant doesn't receive - as usually - the necessary nutrients in form of separate parts (nitrogen, carbon dioxide, water), but directly complete constituents. This allows plant growth to be supported particularly in stress-situations. Some amino acids are auxin constituents and therefore support cell division and root development. Especially in Conference pears, the rosette leaves can still be very small at petal fall, so the rosette leaves are not working as well as they should do; This can cause: reduced set, more misshaped fruit, more russet skin, stronger drop - 2 applications from end of flowering. Low rates of Regalis to reduce fruit drop, especially on young trees! Manganese and Iron - Manganese foliar applications - Fe foliar applications and soil applications. Due to this "white flowering", the fruit set of Opal can be disappointing - Due to this "white flowering", the fruit quality of Opal® and Red Windsor® can be disappointing - Also Junami® has extremely small rosette leaves. "We only covered a few points today - The purpose was mainly to bring some important points to your attention! Most important of all is to make a sustainable profit out of your investments and business spending - We can grow the best and most sustainable fruit but we need the financial rewards from our retailers and consumers AND that is the HARD part!!!!!!!!!! Regular readers will be aware of my attendance at the Rural Focus Group. Founded by Pat Crawford several years ago, the group meets regularly at Hadlow College to discuss important Rural issues and pass on the resulting deliberations to a member of the Press! The UK currently produces about 60% of the food we eat. Whatever happens in relation to the EU we need to up production while at the same time raise public awareness of the reasons why it is important to buy British produce. For a very long time the availability of food has been taken for granted. Seasonality is dismissed as something that existed in the past: 'what we want, when we want it' is now the norm. The very availability of food has resulted in wastage on a massive scale. If we want to ensure food security, if we want to boost the economy, if we want to protect the environment, if we want to retain landscape diversity, if we consider livestock production standards are important, if we perceive the rural sector as fundamental to the British way of life, then we surely must recognise, value and support British farmers and growers. 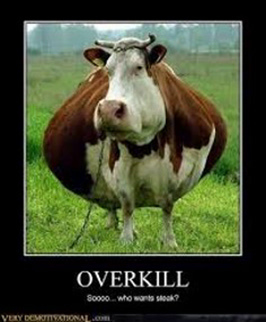 They are amongst the best in the world and our animal husbandry standards are the very best.